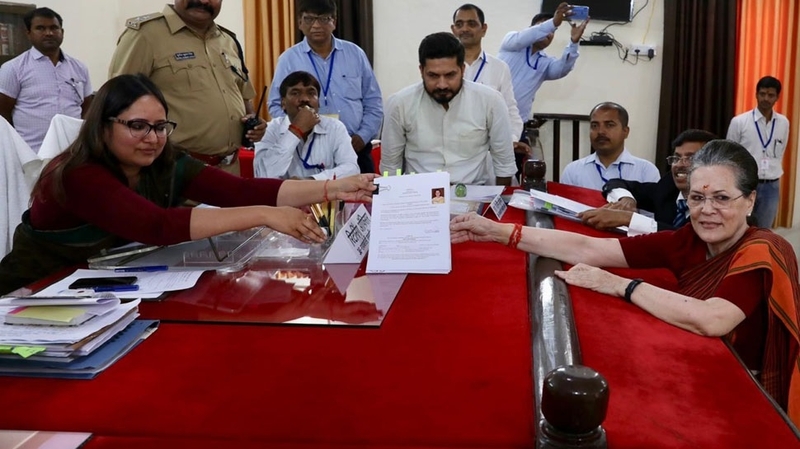 UPA Chairperson Sonia Gandhi on Thursday filed her nomination papers from Rae Bareli Lok Sabha constituency in Uttar Pradesh. She was accompanied by her son and Congress President Rahul Gandhi, daughter Priyanka Gandhi Vadra and her son-in-law Robert Vadra. Before filing her nomination papers at the Collectorate here, the UPA chairperson held a roadshow and offered puja at the Congress central office here. Congress General Secretary in-charge for Uttar Pradesh (East) Priyanka Gandhi, her children Raihan and Miray, and several party leaders attended the puja at the Congress office. Congress workers carrying party flags and banners, gathered at the Collectorate to greet the UPA Chairperson. Sonia Gandhi (72) is seeking re-election from the seat for the fifth time in a row. Rae Bareli, where voting will be held in the fifth-phase of the Lok Sabha polls on May 6, will see a straight contest between Sonia Gandhi and Dinesh Pratap Singh, who recently joined the BJP after leaving the Congress. The Samajwadi Party (SP) and the Bahujan Samaj Party (BSP) have not fielded a candidate in the Congress bastion. Sonia Gandhi had won the seat in 2004, 2006 (by-polls), 2009 and 2014. On Wednesday, Rahul Gandhi filed his nomination papers for neighbouring Amethi Lok Sabha seat. He had also held a roadshow and was accompanied by his family. The three-term MP from Amethi will take on Union Minister and BJP nominee Smriti Irani. Like Rae Bareli, in Amethi, too, the SP-BSP-RLD alliance in Uttar Pradesh has not to fielded a candidate. This time, the Congress President is contesting a second seat, Wayanad, in Kerala where he had filed his papers on April 4. Sonia declares assets worth Rs 11.82 cr: UNITED progressive alliance (UPA) chairperson Sonia Gandhi on Thursday declared personal assets worth Rs 11.82 crore, according to the affidavit she submitted while filing her nomination papers here. During the 2014 general elections, she had declared total assets worth Rs 9.28 crore. Gandhi’s movable assets stand at Rs 4.29 crore, according to the affidavit. She has given a loan of Rs 5 lakh to her son and Congress President Rahul Gandhi, the affidavit says. She has cash worth Rs 60,000 and bank deposits of Rs 16.5 lakh. In 2014, she had declared assets worth Rs 9.28 crore that comprised movable assets of Rs 2.81 crores including 1267.3 grams gold, 88 kg silver and Rs 66 lakh in bank accounts. She has one criminal case against her, filed by BJP MP Subramanian Swamy.